The job market for wildlife biologists has always been competitive. As a rule, there are more people interested in working with wild animals and their habitats than there are jobs. Recent cuts in state and federal budgets have made entry-level positions even more rare. Entry level positions were where college graduates used to get on-the-job training: the hands-on stuff that they didn't get in college classes. As my colleagues and I wrote recently (see page 45 of this on-line publication of The Wildlife Society), Universities are starting to feel the pinch to fill the gap of real-life experience for students. Agencies expect our graduates to be ready to hit the ground running. So, it stands to reason that students with more experience and longer resumes will be more successful! 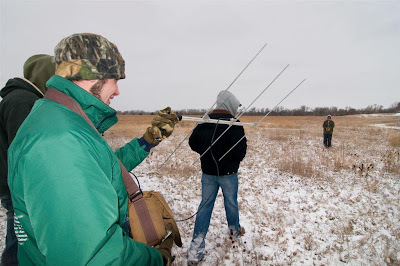 Last week, some of my colleagues in the Nebraska Chapter of The Wildlife Society stepped up to the plate to provide a day of valuable experiences to students. The Nature Conservancy helped plan the day, and we had 15 professionals from the Nebraska Game and Parks Commission, US Fish and Wildlife Service, TNC, Pheasants Forever, and the Rocky Mountain Bird Observatory on hand. The theme of the day was 'grassland ecology and management'. I really enjoyed the day, and we had about 40 students attending from UN-Lincoln, UN-Kearney, Chadron State, and Wayne State. They learned about each other's programs, and we'll look forward to more student/professional collaborations in the future! Chris Helzer, with The Nature Conservancy, shared his experience with prairie management. The TNC's property near Wood River, NE is a great resource for these field outings, and they have conducted experiments with patch burning and other management treatments. 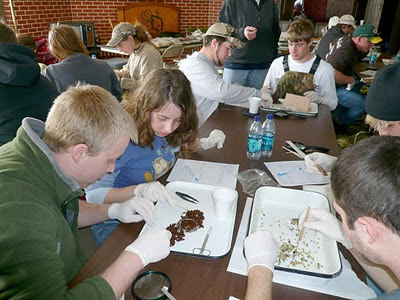 Students had a chance to provide some data to the Valentine National Wildlife Refuge (photo by Chris Helzer). Biologists brought several crops (the first storage stomach in birds) from pheasants, prairie-chickens, and sharp-tailed grouse. Students dissected them and attempted to identify the contents to develop an assessment of their diets. Poison ivy was a big contributor to their diet, along with some small, mysterious (and yet unidentified) seed that had a bright blue core. Gerry Steinauer, a botanist with the Nebraska Game and Parks Commission, explained how prairie restorations are accomplished with these seeders (pulled by ATV's). Students saw the processing facility where seeds of prairie plants are sorted, dried, and mixed to create high-diversity seedings. wow that's fantastic Larkin - I had no idea that was what you were planning for the day! Great blog. Thanks again for all of your hard work!